The Lewis and Clark Bridge (KY 841 / IN 265), the day after it opened. Photo taken by Tom Reaugh (December 19, 2016). Within Kentucky, Interstate 265 is known as the Gene Snyder Freeway. I-265 originates at I-65 near Heritage Creek and concludes at I-71 near Green Spring. Extensions of the freeway west to U.S. 31W near Orell and north to the Lewis and Clark Bridge across the Ohio River are designated as Kentucky 841. 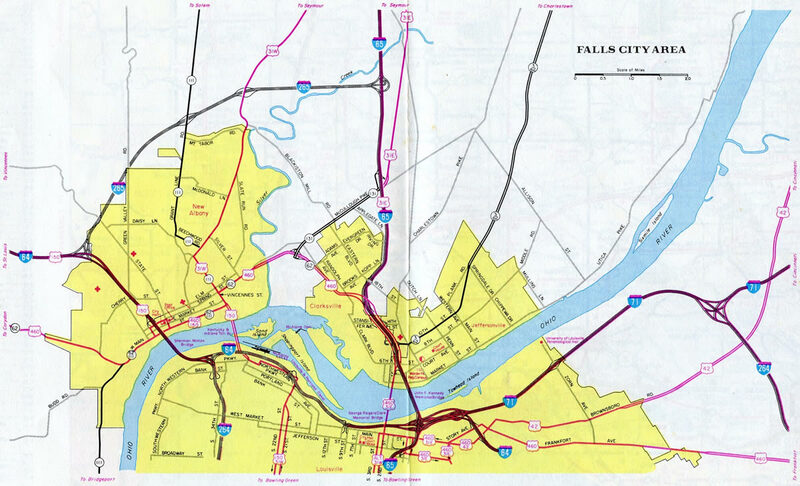 The belt route serves both Louisville commuters and regional traffic for Elizabethtown and points south along I-65 to and Frankfort and points east along I-64. Future road work will upgrade the cloverleaf interchange joining Interstate 265 with I-64. Designs evaluated include a half turbine with loop ramps along I-265 northbound replaced (Alternate 3A), or a directional cloverleaf with loops in the northwest and southeast quadrants removed (Alternate 1). A public meeting on the project took place on January 10, 2019. 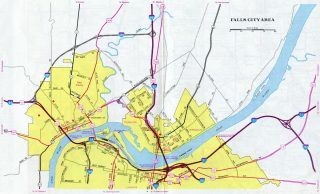 Together with SR 265 and KY 841, Interstate 265 constitutes a beltway encircling the Falls City area of southeast Indiana and the city of Louisville in Kentucky. The beltway provides a bypass for long distance and freight traffic from I-64 at New Albany, Indiana to both I-71 and I-64 along the east side of Louisville. The I-265 designation ends at I-65, while the remainder of the freeway east to the Lewis and Clark Bridge (East End Bridge) is a state road. The cable stayed bridge and approaches will be included within the Interstate Highway System once an application is sent to the American Association of State Highway and Transportation Officials (AASHTO) and after approval from the Federal Highway Administration (FHWA). Prior to the completion of the Gene Snyder Freeway, the route was designated in its entirety as Kentucky 841. 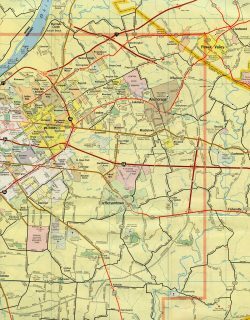 AASHTO approved the establishment of Interstate 265 on June 29, 1978, from I-65 and South Park Road northeast to Interstate 71. The Interstate opened fully to traffic in 1987. 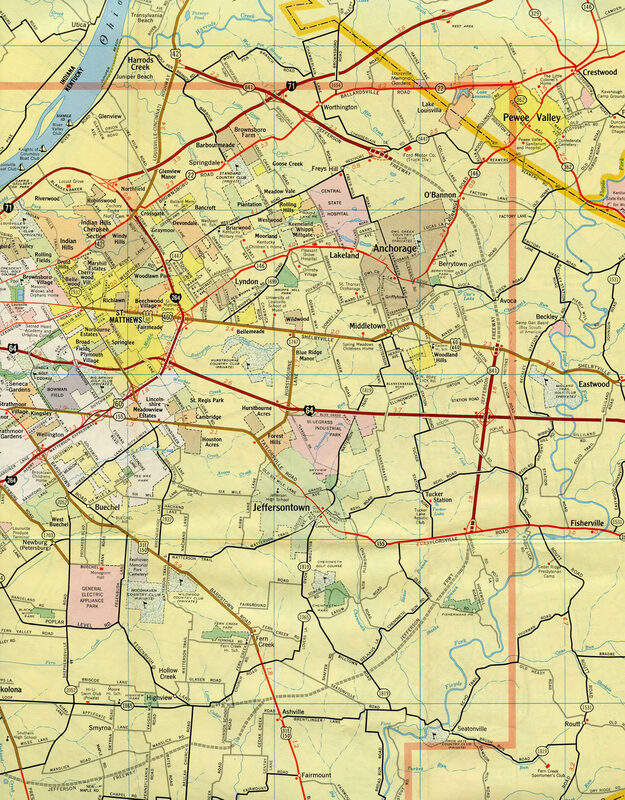 1970 Indiana Official Highway Map showing the proposed route of Interstate 265. The east end was a trumpet interchange. Initial sections of I-265 in Kentucky were signed as Kentucky 841. Known as the Jefferson Freeway, the first section spurred north from I-64 to U.S. 60. Interstate 265 Connector/East End Bridge – $1.29 billion with completion in 2013. Interstate 65 Downtown Louisville Bridge Replacement – $868.4 million with completion in 2019. Interstate 64, 65, and 71: Reconstruct the “Spaghetti Junction” interchange – $1.74 billion with completion in 2024. 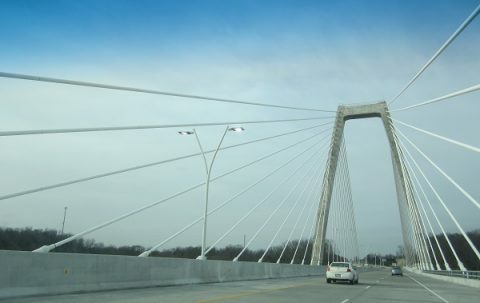 The East End Bridge was a controversial project, but its importance was stressed during the September 9, 2011 to February 17, 2012 emergency shutdown of the Sherman Minton Bridge. Spanning the Ohio River as part of I-64, the Sherman Minton Bridge closed due to steel support beam damage discovered during routine inspections. I-265 Connector/East End Bridge – $1.276 billion with completion in 2017. I-65 Downtown Louisville Bridge Replacement – $1.307 billion (including the Kennedy Interchange and approaches) with completion in 2018. I-64, I-65 and I-71: Reconstruct Kennedy Interchange – $659.8 million with completion by 2024. Accelerated completion of the Downtown Crossing saved approximately $90 million. Design changes and accelerated completion of the East End cut $228 million, including $209 million in design changes for reducing the Drumanard Tunnel by 200 feet in length. Construction finally broke ground August 30, 2012 on the East End Bridge project to build a 3,000 foot extension of Old Salem Road, the first exit on the Indiana side of the Ohio River.6 Work on the Kentucky side followed with construction on the 1.4-mile approach to the bridge, including a 1,700 foot tunnel under U.S. 42 and the historic Dumanard Estate. A partially uncovered sign along Kentucky 841 north ahead of the wye interchange (Exit 37) that now joins the Gene Snyder Freeway with U.S. 42 to Prospect. Photo taken by Tom Reaugh (03/17/16). 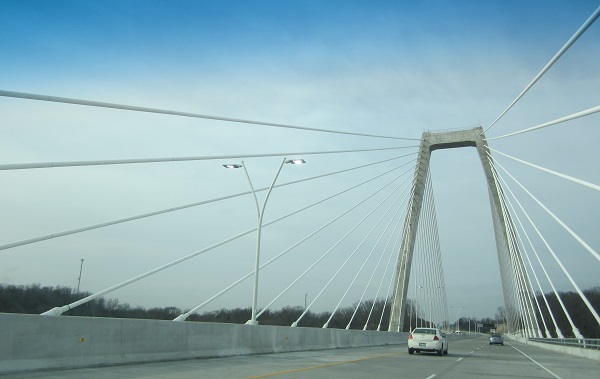 With a final cost of over $2.3 billion, the cable-stayed Lewis and Clark (East End) Bridge formally opened to traffic on December 18, 2016.7 Electronic toll collection commenced for the span on December 30, 2016. Interstate 265 west meets State Street (former U.S. 150) and Paoli Pike ahead of I-64 at New Albany. Photo taken by Steve Hanudel (08/19/05). Indiana 62 accompanies Interstate 64 west from Exit 0 along a 3.6 mile overlap toward Lanesville. Photo taken by Steve Hanudel (08/19/05). Continuing from the folded diamond interchange (Exit 1) with State Street / Paoli Pike, Interstate 265 partitions into ramps for I-64 east to Louisville, Kentucky and I-64 west to Evansville and St. Louis, Missouri. Photo taken by Steve Hanudel (08/19/05). Entering the three wye interchange (Exit 0) with Interstate 64. U.S. 150 runs concurrent with I-64 west to the succeeding exit and east across the Sherman Minton Bridge into Kentucky. Photo taken by Steve Hanudel (08/19/05). Interstate 64 lowers from the Knobstone Escarpment to meet the west end of Interstate 265 (Exit 121) in one mile. Indiana 62 splits with the freeway for the bypass of New Albany and Clarksville. Photo taken by Thomas Decker (06/18/11). Traffic departs from the left side of I-65 east for Interstate 265 & Indiana 62 eastbound. Three interchanges join I-265 with the city of New Albany ahead of I-65 at Clarksville. Photo taken by Thomas Decker (06/18/11). Indiana 62 separates with Interstate 64 & U.S. 150 eastbound at Exit 121 and follows all of I-265 to SR 265 at Watson. Photo taken by Thomas Decker (06/18/11). I-64/U.S. 150 east at I-265 prior to the realignment of SR 62 out of Downtown New Albany. SR 62 previously followed Spring Street to the southeast. Photo taken by Chris Patriarca (05/26/03). Continuing northwest from Downtown Albany, I-64 & U.S. 150 advance toward the three wye interchange (Exit 121) with I-265 & Indiana 62 east. Photo taken by Chris Patriarca (05/26/03). Westbound I-64 at I-265 & SR 62 east to Clarksville and Jeffersonville. U.S. 150 parts ways with I-64 at the ensuing interchange. SR 62 follows I-64 west to Exit 118. Photo taken by Thomas Decker (06/07/12). Interstate 265 & Indiana 62 travel one mile east to meet Interstate 65 at a directional cloverleaf interchange (Exit 7). Photo taken 11/12/04. Interstate 265 ended at Interstate 65 between 1977 and 1995, when SR 265 opened to traffic. The state road freeway links the Interstate system with the Port of Indiana Jeffersonville (formerly known as the Clark Maritime Center). Photo taken by Thomas Decker (06/07/12). Interstate 65 heads south out of Sellersburg and meets SR 60 (Exit 7) ahead of SR 62, SR 265 east and I-265 west (Exit 6). Photo taken 11/12/04. I-265 comprises a northern bypass of Clarksville and New Albany for points west along Interstate 64 to Evansville and St. Louis. Photo taken 11/12/04. A ground level button copy sign preceding I-265 (Exit 6) along Interstate 65 south. This panel was replaced with a sign bridge during 1999-2003 reconstruction of I-65. Photo taken by Jeff Royston (03/17/01). Interstate 65 north through Clarksville was rebuilt in 2003. Exits 6A/B for I-265 west, SR 265 east and SR 62 departs in one mile. Photo taken by Chris and Amber Lokken (04/07/08). 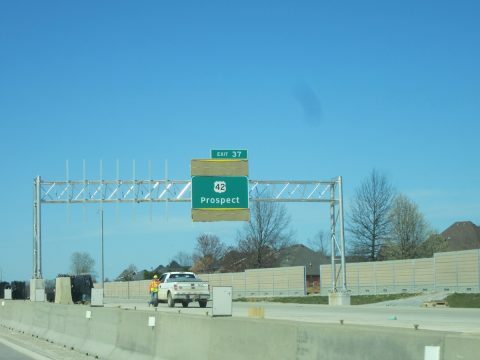 A lane drop occurs along Interstate 65 northbound at Exit 6A for SR 62/265 east to the Port of Indiana Jeffersonville beyond the Progress Way overpass. Photo taken by Chris and Amber Lokken (04/07/08). Northbound Interstate 65 reaches Exit 6A to SR 62 east to Charlestown and SR 265 east to Utica and the Lewis and Clark Bridge into Kentucky. Photo taken by Chris and Amber Lokken (04/07/08). I-65 north at the westbound on-ramp to I-265 & Indiana 62 to New Albany and Interstate 64. Photo taken by Chris and Amber Lokken (04/07/08). An older ground level sign posted for Interstate 265 west before “Revive 65” expansion project was completed in 2003. Photo taken by Jeffrey Napier (07/02). SR 62 combines with SR 265 west from East 10th Street, 2.5 miles ahead of Interstate 65 (Exit 7). Photo taken 06/05/08. Exit 7A departs from SR 62/265 west at the U.S. 31 underpass for Interstate 65 north to Sellersburg, Seymour and Indianapolis. Photo taken 06/05/08. A wide loop ramp joins Interstate 65 south from I-265 west. I-65 leads through Clarksville to the Kennedy Bridge and Downtown Louisville, Kentucky. Photo taken 06/05/08. Interstate 65 approaches Interstate 265 (Gene Snyder Freeway) east and Kentucky 841 (Gene Snyder Freeway) west in two miles. The freeway expands to four lanes at the upcoming exchange. Photo taken by Chris and Amber Lokken (04/07/08). Hutcherson Drive spans I-65 (Dr. Martin Luther King, Jr. Expressway) 1.25 miles south of the half turbine interchange (Exit 125) with Gene Snyder Freeway. Photo taken by Chris and Amber Lokken (04/07/08). Interstate 265 & KY 841 encircle Louisville northeast 15 miles to I-64. The beltway takes a 35 mile long course and returns to I-65 at Clarksville, Indiana. Photo taken by Chris and Amber Lokken (04/07/08). Exit 125A leaves Interstate 65 north for I-265 to Frankfort and Lexington via I-64 and Cincinnati via I-71 north. The succeeding ramp connects with KY 841 west to U.S. 31W and U.S. 60 near Fort Knox. Photo taken by Chris and Amber Lokken (04/07/08). Interstate 65 travels south between industrial areas at Heritage Creek and the Okolona between the exchange with KY 1065 (Outer Loop) and I-265 (Gene Snyder Freeway). Photo taken by Chris Patriarca (05/26/03). One mile north of the half turbine interchange (Exit 125) with Interstate 265 east and Kentucky 841 west. Photo taken by Chris Patriarca (05/26/03). Two additional lanes open along Interstate 65 southbound for the Gene Snyder Freeway west to U.S. 31W/60 for Fort Knox Military Reservation and east to Ashville, Hopewell and other neighborhoods on the south side of Louisville. Photo taken by Chris Patriarca (05/26/03). Exit 125 separates from I-65 south for I-265 east and KY 841. Interstate 65 follows the original Kentucky Turnpike from this point southward 34 miles to Elizabethtown. I-65 continues from there to Bowling Green at Exit 28 and the Tennessee capital city. Photo taken by Chris Patriarca (05/26/03). Exit 125 partitions for I-265/KY 841 east and KY 841 west. Photo taken by Chris Patriarca (05/26/03). Interstate 265 northbound meets Kentucky 22 (Brownsboro Road) 0.75 miles ahead of I-71 (Exits 35A/B). Photo taken by Carter Buchanan (11/13/04). Interstate 265 ends at a cloverleaf interchange (Exit 35) with I-71 on the east side of Louisville. Kentucky 841 extends the Gene Snyder Freeway northward to the Lewis and Clark Bridge. Photo taken Carter Buchanan (11/13/04). Prior to the East End Bridge project, KY 841 comprised a two lane expressway linking U.S. 42 with I-71 and I-265. Photo taken by Chris Patriarca (05/26/03). Entering the exchange (Exit 37) with Interstate 71, KY 841 expanded into a four lane freeway (I-265). Cardinal directions along I-265 switch from north/south to east/west at Interstate 64 (Exit 25). Photo taken by Chris Patriarca (05/26/03). KY 841 accompanies I-265 (Gene Snyder Freeway) southwest toward Middletown, Jeffersontown, and other south Louisville communities. Exit 35B departed here for I-71 south toward Downtown Louisville. Photo taken by Chris Patriarca (05/26/03). Interstate 71 weaves between the suburban neighborhoods of Hill and Dales, Spring Valley and Brownsboro Farm leading toward the Gene Snyder Freeway (I-265/KY 841). Photo taken by Chris Patriarca (05/26/03). The four lane freeway advances east one mile to Exit 9. Guide signs for I-265 omit destinations at both end points. Photo taken by Chris Patriarca (05/26/03). Exit 9A leaves Interstate 71 north for I-265 & Kentucky 841 (Gene Snyder Freeway) south. I-71 travels 88 miles northeast to Cincinnati, Ohio. Photo taken by Chris Patriarca (05/26/03). Two miles ahead of I-265 and KY 841 on I-71 south. Interstate 71 concludes ten miles beyond the Gene Snyder Freeway at the Abraham Lincoln Bridge (I-65) north to Jeffersonville, Indiana. Photo taken by Chris Patriarca (05/26/03). The Gene Snyder Freeway angles northwest across I-71 en route to the city of Prospect and the Lewis and Clark Bridge to Utica township, Indiana. Photo taken by Chris Patriarca (05/26/03). Downtown Louisville lies 12 miles to the west of the cloverleaf interchange (Exit 9) joining Interstate 71 south with I-265/KY 841. KY 841, SR 265 and I-265 arc 15 miles west to New Albany, Indiana. Photo taken by Chris Patriarca (05/26/03). "Bridge plan cost soars to $3.9 billion: New plan: Build eastern span first." Louisville Courier-Journal, December 5, 2006. Kentucky-Indiana Bridges. http://www.kyinbridges.com project web site. “Federal government approves tolls on Kennedy, new bridges.” The Courier-Journal, August 1, 2012. "Ohio River bridges price tag slashed by $240 million." The Courier-Journal, January 25, 2014. "Ohio River Bridges Project Breaks Ground." http://updates.kyinbridges.com/ohio-river-bridges-project-breaks-ground/ The Ohio River Bridges Project web site, August 30, 2012. "Lewis and Clark Bridge, East End Crossing Open to Traffic." www.eastendcrossing.com, December 18, 2016.